The 16.1 megapixel Sony SLT A57 digital SLT camera is aimed at a very discerning camera buyer: Goldilocks. Papa Bear might prefer the bigger, more complicated and more expensive A77; Mama Bear might pick the lighter entry-level A37, but if Goldilocks is the photographer I think she is, she’s going to think the A57 is just right. And so may you. Sometimes you can get a cat to pose, and here she is at ISO 1600. In the new Sony product lineup, the A57 replaces the original A55 SLT released two years ago to much fanfare. But the A57 improves on its predecessor in almost every area. Like the A55, the A57 has a fixed translucent mirror rather than the reflex mirror found in most DSLRs; the fixed translucent mirror design allows the A57 to provide constant, swift phase-detect autofocus, as well as frames-per-second rates never seen in this class of camera (10 frames per second or 12 fps in a special reduced image-size mode). The A57's body is still plastic but it feels sturdier than the A55. The A57 is also bigger, in fact, the A57’s body is just about the same size as the more expensive, 24MP A65. But you can't make a cat pose for long! The A57's face detect feature and the phase detect autofocus can capture subjects on the move. The A57’s electronic viewfinder (EVF) is also improved. It doesn’t use the OLED technology that makes the EVF in the A65 and A77 so remarkable, but its 1.44 million dots, 1.04x magnification, 100 percent frame coverage and excellent eye-point (23.1mm standard) improve considerably on the A55 and on the other predecessor that the A57 replaces, the formidable A580, the last of Sony’s conventional DSLRs. If you wear glasses you will appreciate that the A57 lets you adjust the eyepoint for more comfortable viewing of the EVF. Sony Alpha A57 back view. A final major area of improvement is in video. The A57 is one of the very few cameras in its price range that offer 1080p full HD video recording in AVCHD format and stereo sound input; it can also record in the lower-resolution, but more user-friendly MP4 format. As with Sony’s other SLT models, the A57 lets you use phase detect tracking focus while shooting video. You can see the A57’s constant phase-detect autofocus working in the video above, as the camera moves from dog to dog. This option is possible as a result of the camera’s SLT technology. Note that you can also hear the lens autofocus mechanism working. A quieter lens works better; this movie was taken with the Sony/Zeiss 16-80mm, which is not an SSM (supersonic wave motor) lens. Or you can use an off-camera mic. This movie is shot in 1440-by-1080 MP4 format. The Sony A57 also supports true HD 1080p AVCHD format. Of course, not everything is new. The 3-inch, 921,600 pixel tilt-swivel LCD screen is little changed from the A55. And the A57 has in-body image stabilization, like all Sony’s SLT cameras—and unlike the competition from Nikon and Canon. I’m particularly glad that the A57 retains the A55’s simpler controls on the back of the camera. I prefer the A57’s multipurpose control dial to the twice-as-expensive A77’s joystick. There's an old saying: "The best camera is the one you have with you." It applies to lenses, as well. Thanks to its inheritance from Minolta and its partnership with Zeiss, Sony makes and sells some outstanding lenses, and the point of an interchangeable lens camera is still to be able to use the best lens for the job at hand. But some of the features in Sony's recent cameras will help you out if you don't have an ultra wide-angle or telephoto lens with you when you need it. The sweep panorama feature, for example, is so good—and so easy to use—that ordinary users may not feel the need to buy a super wide angle lens. And in the A57, Sony adds a feature found for a while in its compact cameras called Clear Image Zoom, which makes it less necessary to have a telephoto lens in your bag. This shot was taken with the Sony 55-200 zoom lens at 70mm, without Clear Zoom enabled. The image is enlarged 50 percent. 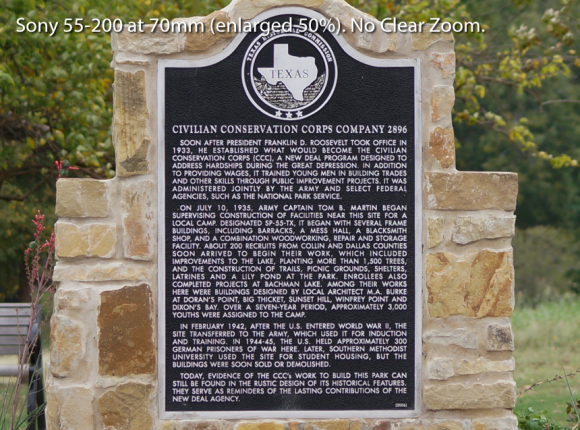 The print on the monument is indeed a little clearer than on the other shot using Clear Zoom—but the difference is small enough it may not matter much of the time. Using the Clear Zoom feature on the A57 I was able to use my 50mm prime lens to capture an (effective) 70mm lens field of view. It is shown here enlarged 50 percent so you can compare its clarity of detail to the companion shot. Clear Image Zoom is digital zoom—with brains. It uses Sony’s awkwardly named By Pixel Super Resolution technology to interpolate pixels based on context, resulting in a full-resolution image with little degradation in the detail. I tested the A57 with several lenses. Using the excellent Sony 50mm f/1.4, I was able to use Clear Image Zoom to achieve a telephoto reach equivalent to 70mm and 100mm. The resulting shots, when viewed very closely, were less sharp than photos I took with the Sony 55-200 lens at these focal lengths and without the Clear Zoom feature enabled. But the Clear Zoom shots were pretty good, more than good enough to display on the Web and good enough even for typical prints. Used the HDR Painting creative effect in the A57, on "high." This effect actually takes three shots—so fast that I got Abby's yawn without blurring. The same technology is also used for another of the A57’s novel features: Auto Portrait Framing. This feature re-crops your portrait photos so that the subject is enlarged in the frame and the shot is recomposed according to the Rule of Thirds; this recomposition basically means that the subject is moved from the center to one side of the photo. Thanks to By Pixel Super Resolution, the recomposed image is a full resolution photo. The feature is more of a curiosity than anything else, but it’s fun to play with, and while it’s rather formulaic, it may be useful as a teaching tool for novice photographers. And it’s harmless. The camera preserves your original shot and offers the recomposed shot as a second image file. Auto Portrait Framing "before" shot. This feature only works if you shoot in horizontal orientation and include a fair bit of background. Auto Portrait Framing "after" shot. 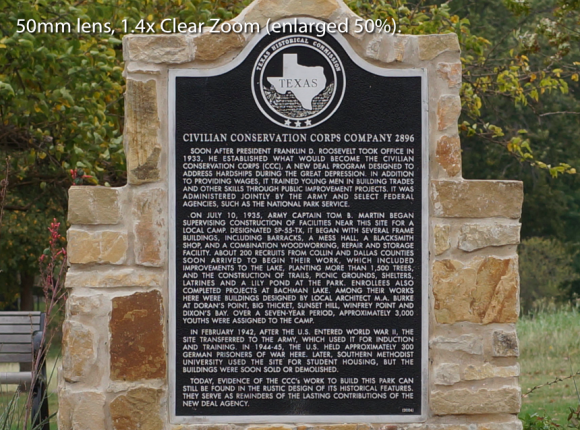 The camera crops the image to place the subject off-center and then uses By Pixel Super Resolution technology to interpolate pixels and create a full-resolution image. I wouldn’t crop this picture this way but the feature is fun to play with and harmless—you get to keep both the original and the cropped version. TechHive Labs' testing showed the A57's 16MP sensor delivers good to very good image quality in most categories. If you can afford a high-quality lens or two and are willing to shoot in Raw format, you can get exceptional results from the A57. But most users will be more than satisfied with the A57's JPEGs. The picture of the dog sleeping on the lounge chair below is an in-camera JPEG. It exhibits good color and dynamic range and excellent detail; there is no noise in the main area of the image and only slight noise in the dark, blurred upper left background (typical of digital cameras). And as I've suggested above, some of the A57's most interesting features, like multiframe noise reduction, sweep panorama, and clear zoom, produce images that you'd have to spend a lot more money to improve on. Most of my complaints about the A57 are minor. The A57’s Auto ISO goes from 100 to 3200, whether you like it or not. You can’t set the upper or lower limits as you can on the A65 or A77. The default setting for high ISO noise reduction (Normal) may lead to noticeable blurring of detail. Changing this menu setting to Low worked well for me. The only feature found in the A55 and not in the A57 is GPS—the only omission that I really regret. The A57 can be purchased body only or in packages with a couple of different lenses. I recommend buying the 18-135 lens, or even better, buying the body only, and getting one of Sony’s better lenses, say, the very affordable DT 35 f/1.8 prime or the pricier Sony/Zeiss 16-80 zoom. The sensor deserves a good lens. Sony’s Image Data Converter software, which comes with the camera, is not exactly awful, but so sluggish on a Mac it doesn’t matter. Most users will be better off using one of the many free or inexpensive alternatives available these days, such as Picasa, iPhoto, Aperture, or Lightroom. The camera shoots excellent raw files and if you’re interested in making prints, you’ll probably want to shoot raw. But the A57 is a camera that can be used happily by most photographers in JPEG mode and you can even do all your processing in the camera. At ISO 200, the A57 captures nice, clear JPEGs, especially if you use a good lens. This was taken with the Sony 50mm f/1.4 lens. Every camera is a package of compromises. It’s impossible to get a camera with a well-built durable body and user-friendly controls, that takes high-quality photos in both raw and JPEG, does pro-quality video capture, offers options that will satisfy both enthusiasts and occasional shooters, that’s equally well-suited to action, family events, portraits, and landscape shooting, and comes at a reasonable price. It really is impossible. But Sony comes pretty close with the SLT A57.